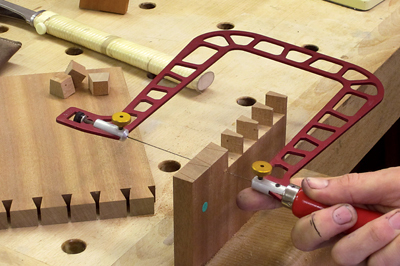 Knew Concepts produces a range of fret saws which were designed for use by jewellery makers. 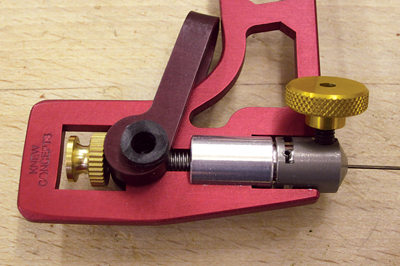 Over time they have become increasingly popular with woodworkers due to their accuracy of cut and ease of use. Unlike normal fret saws the frame is made from rigid aluminium and firm tension is created with a screw or a cam lever depending on the model. In practice, this means that if you aim it straight, it cuts straight. There are two standard fixed blade models and one with a swivel blade. The 125mm fixed blade has a 125mm capacity from the blade to the inside of the back with the 200mm model offering a larger throat. What strikes you immediately on picking one up is just how light they are. Indeed, the larger 200mm feels hardly any different to the smaller one. Whilst these saws will have many uses in the workshop, it is removing the waste between dovetails for which they are most useful. With a little practice you can consistently saw to within 1mm of the baseline which greatly speeds up the process of chopping down to the line. The capacity of the 125mm saw can be doubled by turning the board around, although the small extra cost for the 200mm saw, which handles just as well, is probably worth the extra investment. The more expensive swivel blade version means you can effectively get the frame out of the way, which enables it to handle any width of board. It swings 45° each way and there are built-in stops at all three positions. The quick release cam mechanism works well and this is particularly useful for frequent blade changes. All three models take standard pinless fretsaw blades and the one I have found most useful is a 15tpi skip tooth blade which is thin enough to get down the kerf and turn the corner but coarse enough to cut quickly through hard woods. These saws are not cheap and they are not an essential tool, but once you have used one you will never want to go back to the traditional style.